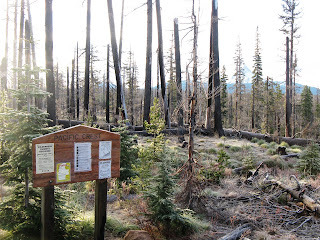 The trailhead for Three Fingered Jack is located just above the Santaim Pass off Hwy 20. I started out very early just as the sun was awakening. The plan was to hike an 11 1/2 mile loop. 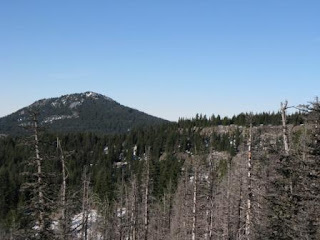 I wanted to view Three Fingered Jack from the western side just at its base and then head cross country to Santiam Lake. The area was burned several years ago. Burn areas are somewhat depressing to be in during the summer. Everything is dry and paltry. Heat beats down and little relief can be found. In the winter however, burn areas take on a different look. The trees (or effectively their remaining carcases) reflect the light with shadows that give them a really interesting quality. The map of the trek. Snow had fallen a few days earlier, but at this low elevation, starting off at 4,800 feet, the going was easy. 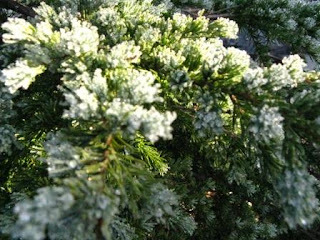 Frost was still glimmering on the evergreens. An odd formation along the trail. This a huge pile of rocks that almost constitutes a butte. This pile of lava rock is a few miles to the south of Three Fingered Jack. According to the history of that volcanic explosion, this rock oozed out in chunks and gathered here. This pile is some 300 feet high. The sun shining upon a frozen bog in the early morning. Maxwell Butte at 6,220 feet. 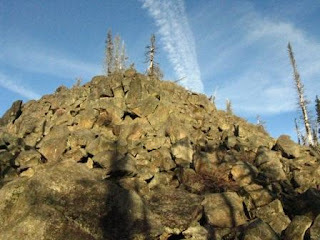 A trail on the left (SW) flank of the butte leads to Maxwell Sno-Park along the Santiam Hwy about 4 miles to the west. Might make a good hike with the boys some day. 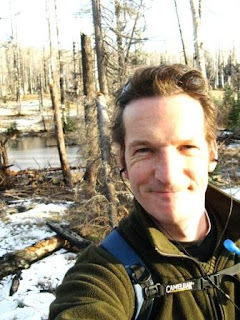 Indeed while I didn't see any humans for the 10 hours on this expedition, I did see a bunch of deer tracks and coyote tracks like this one above. Commentary and silence at Three Fingered Jack. 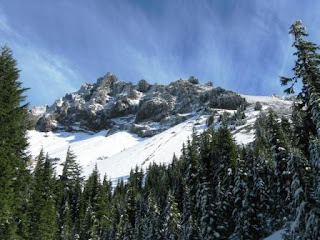 After 4 hours of mellow going, I reached the based of Three Fingered Jack-7,841 feet. During my hike to this spot at 6,300 feet, I found the best view of the mountain. The mountain was named because from the east, the now eroded volcanic plug sticks up like a finger as does two adjacent surrounding points of rock. This is clearly not apparent from the west. I wanted to scramble up that ridge on the right of the photo so badly and it looked totally doable. However, being solo you have to take precautions. For one, I hadn't told anyone I was doing that-going off trail and bagging the peak so if I got into trouble, I'd be hard to find. Secondly, I had been out to the point when I had to start thinking about the amount of remaining daylight. 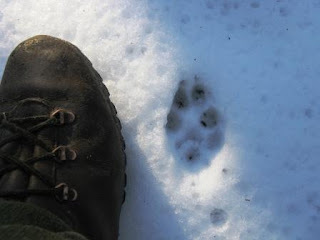 Perhaps the only down side to winter hiking. Even with all that the most stirring and compelling reason not to summit Three Fingered Jack on this day was the unique situation. Everything had frozen overnight at that elevation. The silence that had existed at 5,000 feet was gone. 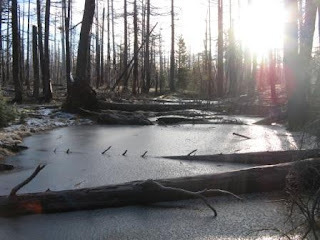 The midday sun was melting everything and the crash of ice from trees was making such a cacaphony it was eerie. The mountain also spoke out. When I took this picture, about every 10 seconds, another rock would peel off the mountain and crash down. Great motivation to not climb!